1914 Young Cecil B. De Mille's first motion picture was The Squaw Man (1914) - it was the first feature-length film produced in Hollywood by a major film studio (it was distributed by Famous Players-Lasky Corporation). It was the first film to use an art director. However, it wasn't the first film to be made in Los Angeles. 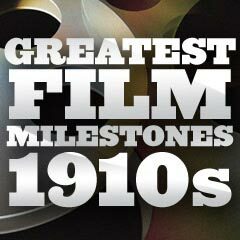 1914 The start of the Great War (WWI) interrupted European motion-picture production and eventually brought it to a halt when there were signficant shortages of power and supplies. It never recovered its dominance in the marketplace. The American motion-picture industry thrived on business and viewership in the European market, using their profits to produce even bigger and better motion pictures. 1914 Lois Weber became the first woman to direct a full-length feature film in the US - the Rex production of The Merchant of Venice (1914), in which she also played the role of Portia. She co-directed with her husband Phillips Smalley (who played the part of Shylock). 1914 The first professional film stuntwoman was Helen Gibson, who often stunt-doubled for actress Helen Holmes in the early episodes of Kalem Company's serial or series entitled The Hazards of Helen (1914-1917). In 1915, Helen Gibson took over the lead role from Helen Holmes, beginning with episode 49. There were a total of 119 episodes over four years -- and at a total of 23.8 hours, it was claimed to be the longest film serial ever made. 1914 Author L. Frank Baum's 1913 published book, The Patchwork Girl of Oz, was also released by his own short-lived independent film company, the Oz Film Manufacturing Company, as a feature-length film, titled The Patchwork Girl of Oz (1914). It was the first feature-length film based on one of his many books. Earlier in 1900, Baum had published the children's novel The Wonderful Wizard of Oz, adapted as a Broadway play in 1902 and later made into the classic film The Wizard of Oz (1939). 1914 Charlie Chaplin, a silent actor and pantomimist, was recruited to Keystone Studios from an English variety act, and became Mack Sennett's most important discovery. Chaplin made his film debut with the release of the Keystone Cops comedy short Making a Living (1914) - in his first film, he played the part of a "Swindler" (not his "Tramp" character). It was the 6th of 12 Mack Sennett films featuring the Keystone Cops. 1914 1914 was the year in which silent comedian Charlie Chaplin made dozens of films and became filmdom's first great star. He made 35 short Keystone films for Mack Sennett in 1914. 1914 The silent comedian Charlie Chaplin debuted his trademark small-mustached, derby-hatted, baggy-pants, bamboo-caned 'Little Tramp' character with oversized shoes in his second picture, the 11-minute Kid Auto Races at Venice (1914), attending a home-made "pushmobiles" race for boys in Venice, California. The head of Keystone Studios, Mack Sennett, had instructed Chaplin to wear something funny ("comedy make-up"), and the costume was debuted in the film. It was the Tramp character's first public appearance. [Note: In fact, the Tramp costume was devised for a film produced a few days earlier, titled Mabel's Strange Predicament (1914), but the film was released two days later.] The gallant Everyman character portrayed by Chaplin would become Keystone Studios' most popular. It also became Chaplin's most famous, enduring and legendary character, until it was retired at the conclusion of Chaplin's Modern Times (1936). 1914 At Keystone, Mack Sennett made the first American feature-length comedy - Tillie's Punctured Romance (1914), starring Marie Dressler, Mabel Normand and Charlie Chaplin (in his first feature film). 1914 Director George Pearson's early silent film (a "lost film") was A Study in Scarlet (1914, UK), the first British film to feature Sherlock Holmes (from the Sir Arthur Conan Doyle novels) - although it neglected to portray his assistant Watson. Novice actor James Bragington, who resembled Holmes, took the role of the lead character because of his uncanny likeness to the detective - it was his sole acting performance. 1914 Winsor McCay created his third animated film - Gertie the Dinosaur (1914). It was the first "interactive" animated cartoon and character, and was the earliest example of combined 'live action' and animation. The brontosaurus dinosaur's appearance made Gertie the first animated cartoon star. 1914 Serials regularly added cliffhangers as one of their features, in multi-part serial films such as The Perils of Pauline (1914) with 20 episodes (although a condensed 9-part version is all that exists today), featuring Pearl White as the 'damsel in distress' title character. It was the most famous suspense serial in cinema history, although not the first. 1914 The world's first feature-length color film (Kinemacolor), the crime drama The World, the Flesh, and the Devil (1914, UK), premiered in London. 1914 Grand cinema houses were regularly replacing cheaper nickelodeons. For example, the first 'real' and elaborate movie "palace" built for movies only and without a stage, The Mark Strand Theater, opened at Times Square in New York with seating for 2,800. 1914 Bert Williams appeared as an actor in his first film Darktown Jubilee (1914). It was one of the first movies to use an African-American actor in blackface, rather than using a white person in the same role in blackface. 1914 The influential three-hour (14 reel) Italian silent film from Giovanni Pastrone, Cabiria (1914), was an early example of spectacular and monumental epic film-making. It laid the pattern and groundwork for future big-budget feature-length films (by the likes of D.W. Griffith and Cecil B. DeMille). Its story of 3rd century BC Ancient Rome included sequences of the eruption of Mt. Etna and Hannibal's crossing of the Alps with elephants (with an early example of tracking shots). The landmark film was shot on location in North Africa, Sicily and the Italian Alps, and reportedly contained the first use of dolly-tracking shots (which became known as 'Cabiria' movements). It was also the first film ever to be screened on the White House grounds. Its production cost of 1 million lira made it the most expensive film of its day. Many claimed it was the first feature-length film, although The Story of the Kelly Gang (1906, Aust) took that claim. 1914 Paramount Pictures was founded in Los Angeles as a start-up company in order to release the films of Jesse Lasky and Adolph Zukor's Famous Players Film Company. It soon became the first successful nation-wide film distributor. 1914 The Photo-Drama of Creation (aka the Eureka-Drama in its abbreviated version), a 1912 religious production by Charles Taze Russell through the auspices of the Watchtower Bible and Tract Society (representing the Bible Student Movement), was the first major screenplay which incorporated synchronized sound (recorded speech), moving film, and magic lantern color slides. Since its run-time was 8 hours (480 minutes), the b/w show (with some hand-colored slides), providing a religious survey from the time of Creation to the end of the Millenium (the 1,000 year reign of Jesus Christ), was divided into 4-part sets. Multiple copies of sets were made so that it could conceivably be shown in 80 different locations at the same time. It was introduced at a premiere in January of 1914 in New York, and was later screened that summer in Germany. By the end of the year, it was estimated that 9 million people had seen the production in North America, Europe, and Australia. 1914 NY nickelodeon owner William Fox entered production with the Box Office Attraction Company (BOAC) that released Fox's first production, Life's Shop Window (1914). In the following year, the Fox Film Foundation was also established - soon to become one of Hollywood's foremost studios.